Accessories for pastels are handy additions to your studio, but they are by no means essential to making art with pastels. The coolest thing about pastels is their ease of use. With just a piece of paper, some pastels, and your fingers, you can create a complete work of pastel art! If you're just starting out, keep things simple. As you become more accustomed to working with pastels, you can think about which accessories might enhance your artworks. Let's take a look at the following accessories for pastels to give you an idea of what you might need: Fixative, Blenders, Erasers, Sharpeners, Pastel Holders, Pastel Boxes, and Safety. Pastel particles can be easily smudged, wiped, or knocked off the surface - which you may do on purpose at times, but there are other times during and after the creation of your pastel art when you want those pastel particles to stay firmly in place. That's where fixatives come in! Fixatives are designed to fix the particles in place so that they won't dislodge during and after creation. There are two main types of fixative: workable and final fixatives. Workable fixatives are handy for use between layers, so that colors will stay in place when you're layering or blending. Workable fixatives are also useful if you have to leave an unfinished work for a while, and you want to make sure it's protected in the meantime. Workable fixatives aren't essential; they're more a case of personal preference. You can still layer and blend without them, and if you want to protect an unfinished painting without using a fixative, you can take some glassine or tracing paper and tape it over the artwork. These sheets are nonabsorbent so they won't attract or disurb the pastels. Final fixatives are for finished paintings (not reworkable) and will protect them from smudging, air pollution and ultra violent light. Final fixative can be purchased for use with a diffuser, but I prefer the more convenient spray can. I usually protect my pastel artworks by framing them behind glass, because fixatives can alter the finish by darkening the tone of lighter pastels and dulling the colors. Some artists like this effect, while others avoid fixatives entirely. Before using any fixative I'd recommend testing it first to see how it might affect your colors. When I do use fixatives on finished pastel works, I use Golden Archival Spray Varnish (which is handy because I can also use it on other media). 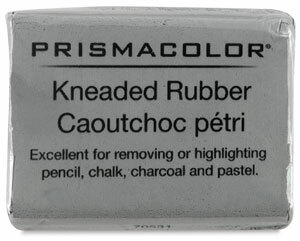 Some fixatives are meant only for water-based media, which means you can't use them with oil pastels. Just make sure you read the product description before buying or buy something made specifically for oil pastels, like dArtigny Oil Pastel Fixative by Sennelier. Many pastel artists enjoy using their bare fingers with pastels, but there are a wide range of accessories for pastels that you can use to blend and manipulate pastels. 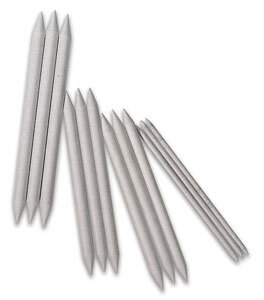 Stumps or tortillons are traditional blending tools for pastels made from tightly-rolled paper that is pointy at one end. When the end becomes dirty you can just peel away a layer of paper to reveal a fresh point. You can also buy brushes designed specifically for blending that come in a range of shapes made from natural or synthetic fibers. Brushes can also be used to remove pastel by gently flicking it off the surface. 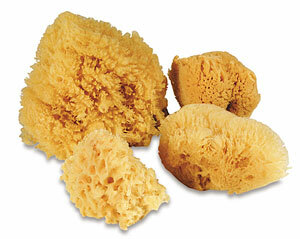 Sponges are also commonly used for blending and can be purchased mounted onto a wooden handle for extra control. 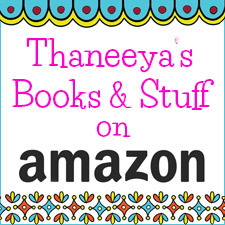 You can also save some money by using basic cotton swabs or balls for blending. If you prefer to blend pastels with your fingers, you might want to try wearing finger cots, which will keep your fingers clean and protected. 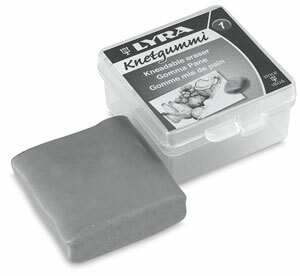 Your best eraser option is a kneadable or putty eraser which can lift off color. 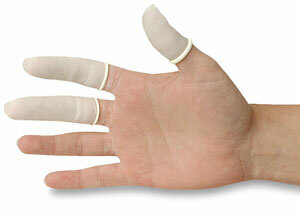 They can also be shaped to a fine point which allows you to remove tiny sections. Pastel particles can also be flicked off the support with a stiff brush. Most commercially available erasers won't work with pastels, and oil pastels can't be removed with an eraser at all. Avoid latex and plastic erasers because they'll just rub the pastel particles deeper into the tooth of the surface. Some accessories for pastels can be surprising. One artists' trick is to take some fresh bread and roll it into a soft ball. It's quite effective at extracting pastel particles. The best accessory for sharpening pastel sticks is a sandpaper block. It's simply a pad of sandpaper sheets attached to a small piece of wood. 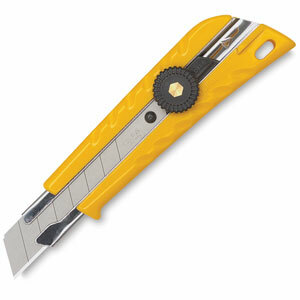 You scrape the pastels (and pencils too) along the rough surface to make sharp edges that are perfect for detail work. When it comes to pastel pencils, you can use a regular sharpener - but to avoid the risk of breaking the pastel cylinder I recommend using a sandpaper block or a sharp knife. Having a knife in your studio is also handy when you need to cut paper or when using scraping techniques on your artwork. 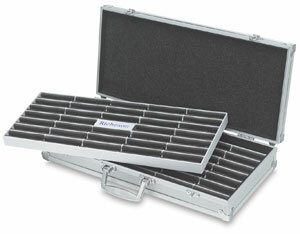 Pastel holders, also called graphite or charcoal holders, are convenient when you want to be able to use a worn-down pastel stick and maintain control. 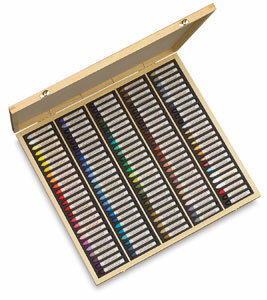 When you've spent a fortune on artists' quality pastels you don't want to waste a single pastel particle! 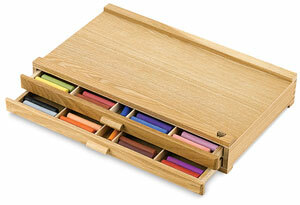 Pastels holders are also used by artists who don't want to get their hands dirty. Pastels can be really messy, so I also keep some wet wipes nearby. 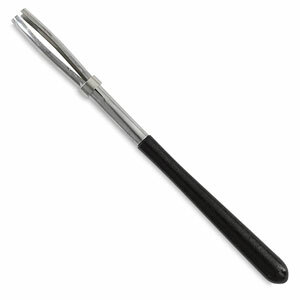 Holders can also help artists who find it easier to grip and control a holder than a slim pastel stick. Pastels are fragile and delicate and need to be protected so they don't break. You can buy wooden, metal, plastic and cardboard boxes, and all feature snug slots for your pastels so they don't move around and mix with each other. 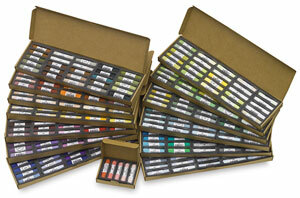 Boxes also help you keep your pastels organized and in order. Box sets usually come with suitable storage boxes or at least a tray of some kind, depending on the quality of the pastels. 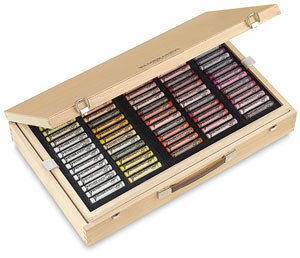 You'll really only need to buy a box or cabinet for your pastels if you buy them individually. I briefly addressed safety on the introductory pastels page, but I thought it was worth mentioning again. 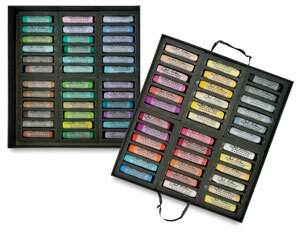 Soft pastels release airborne pigment dust which can be easily inhaled. Most manufactuers now produce non-toxic pastels, but it's always wise to take precautions. I try to use pastels outside or in a well-ventilated room. There are accessories for pastels that can help. Some artists wear face masks or respirators, but I find them too uncomfortable. My husband and I recently splurged on an air purifier which helps keep my studio dust free and also relieves his allergies.